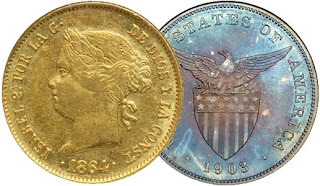 The soaring prices of oil, food, and major commodities these days has a tremendous effect on the stocks of available silver and gold coins in the market. Prices have increased tremendously over the past few days since the reported major bank failures these past few weeks, as the INDYMAC BANK of California succumbed to bankruptcy after its shares went down, and the U.S. Treasury giving a warning that about an estimated 90 banks are on list that might suffer the same fate. Gold climbed to more or less than $15 a day, signaling that the escalation would either match or surpass the record held last March. Today, Gold is steady at $970 while silver at $18 an ounce. Even the current supply of silver and gold coins available on the street or the black market is dwindling, a sign that more and more people are becoming aware of the current financial situation. Local prices have already escalated, particularly, the silver United States and Philippine pesos and the Mexican Eight Reales. Gold coins are becoming very scarce so the price of Spanish-Philippine gold coins cannot be estimated as of the moment. The current local selling price of gold on the black market is between P1400 to P1500, which is P200 higher than the previous price five months ago. Meanwhile, even the prices of other metals such as copper and nickel have already gone up due to the rising cost of fuel and other commodities.